I have had many a Baltic porter and this was a decent one. The body was a tad thin, but the slight smoked malts made up the difference. If you follow the local blogs: these malts were smoked in house with apple wood. All the needed bits were there: weak coffee, bittersweet chocolate and minor fruitiness. The linger was short lived with a dark lager smear. Very nice. I wish my glass wasn't a sampler size. This tasted almost identical to the Hoyne Gratitude. Nicely warming with a balance of sherry, wood, bready plums and mild spices. Very clean ending with only a hint of warmth. Well worth the price of admission. So I made it my mission to try every Victoria release this year. This was not an easy task; it was a great year for Victoria's beer geeks. Some releases I never bothered blogging, most of them I tweeted or Untappd. This is the case with Phillips Instigator 2012, not worth mentioning. The only thing worse you can spend $8 on is a parking ticket. Now we come to the Trainwreck. I remember the days when a pre-2010 Phillips barley wine was something to look forward to. The same can be said for the Instigator and the Double Dragon. What I wouldn't give for a 2008 Double Dragon! 2011 was the year I started skipping Phillips regular seasonals. Even the freeze distilled 2011 barley wine (Mass Extinction) was tasteless. This years edition was aged in bourbon barrels. So what does the #yyj beer geek think. I can already hear the shouts of "WTF are you talking about?" Hear me out. This is a very approachable barley wine. The nose is calm with sweet vanilla and caramel. Maybe there is a bit of cheap Alberta vodka and nailpolish in the nose - but we are not going to mention that. People will be drinking this cold. The body is not insinuatingly bold nor painful to ingest. Perhaps I am alluding to another local barley wine that is not for the faint of heart. Every sip exhibits a nice barrel aged blot. Sweet vanilla, bourbon, rum and wood chips is what you will get. This ravels nicely with the caramel malts and earthy hops. Yes, it is a tad thin and overly boozy (especially at room temperature). Not everyone has the patience to sit on a bottle of barley wine for a year until it is ready to drink. This facts becomes painfully apparent as I stare at a bottle of Mill St. barley wine and ponder, "When?" It reminds me of an Innis and Gunn turned up to 11; or else with a depth charge of Grey Goose. Cellarable? Not likely, the alcohols are not fusel and all ethyl. In some communities you must build. Perhaps after tasting this barley wine; people next year will branch out and try others. I think the only ones who buy OCD are myself and my beer prick friends. You always find old vintages of OCD mysterious appearing at cold beer and wine stores. Perhaps this review was influenced by recent events; last week I interviewed Matt Phillips. Albeit was for only 3 minutes and 12 seconds. But the man I met was passionate about craft beer and knowledgeable about flavour and taste sensations. I was very furtive and never mentioned who I was. We chatted and I asked stupid, opened ended questions. He gave vague but intelligent answers. It changed by perception of Phillips. It makes me wonder if the vision in his mind hits the bottles on the shelf. Who knows? Whenever I see a bottle of Analogue 78 on the shelf, I must remind myself: people are drinking local, craft beer. Appearance +1 Lots of big people love the label also. I am sooo far behind in my beer reviews. 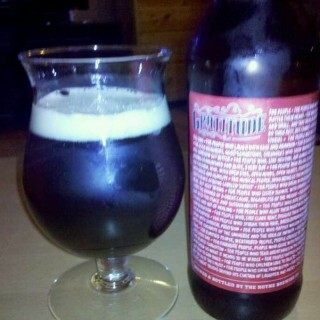 I am not even close to choosing my top ten beers of 2012! It will be a long few weeks; please don't let there be any more Victoria beer releases. Enough self-indulgent first world problems. This beer was Phillips Breweries choice of beer to brew from the winners at the CAMRA 2012 homebrew contest. Eric won first place in the American Ales category. Quite the honour; but how does it taste? If I judged this beer at that BCJP contest, it would not score high. Ambers are not usually this hoppy. But for enjoyment and drinkability; it scores top marks. It delivers everything a hophead wants: juicy citrus, floral, hints of pine and an abundance of caramel malts. Each sip was full and creamy, yet satisfyingly astringent. 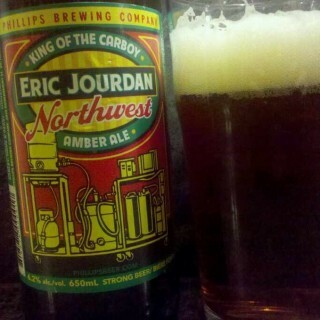 The NW amber ale was hop forward with a massive mixture citrus hop punch, backed up with creamy and toasted bready malts. A long, smooth finish left a sweet citrus astringency. Everyone knows I'm a sucker for great packaging. Perhaps this is why I dropped $17 on a bottle of Mill Street barley wine. Props to Hoyne for bringing us the most elegant bomber to date. The packaging reminded me of the paper wrapped De Ranke releases. The style of winter warmer is all over the map. It allows for the brewer to impart their creativity in a bottle. Spiced or unspiced, high or low ABV, additional fermentables (molasses, honey) can be used, fruits added, the possibilities are endless. A bright sherry red elixir hits the glass and displays an ample rose coloured head. The grateful nose is fruity (cherries, rosehips), with biscuits, toast and wood. Nothing new in the sip but there is a bit of spiciness present; from the alcohol perhaps? This beer reminded me of a slightly thin version of Fuller's Vintage. Once the warmth fades, a little herbal honey with spices remained. Very nice. I don't think this one will cellar well, so drink it fresh.